The life of Mr. Piper and his losses during the Civil War interested me to the point, I had to tell his story. James E. Piper (Ramsay) and his brother, William Henry Piper (Ramsay) were freed people of colored prior to the Civil War. They registered in Alexandria County in 1846. James was described as a mulatto man, about 26 years old and 5 feet 3 ½ inches tall. He was born free in 1820. His mother, Elizabeth Ann Piper Ramsay, a white woman, confirmed her son was born free. William Henry Piper (Ramsay) was also registered in 1846. William was born in 1825 and he was a mulatto man, about 22 years old, 5 feet 5 ½ inches tall. His mother, Elizabeth Ann Piper Ramsay, a white woman, said her son was born free. James and William and their wives lived in Alexandria, Virginia, but the two brothers leased one-hundred acre farm land from Edward Daingerfield and his wife in the West End, about four miles from Alexandria and a half mile from the Episcopal Seminary. They had leased the land for $75 a year and they had a brickyard and a farm. They had farmed the land for a couple of years prior to the Civil War. Prior to the Union occupying Alexandria, Edward Daingerfield died. The Piper brothers continued their lease contract with Mrs. Daingerfield. Around late July of 1861, Blenker’s Brigade camped near the farm after the battle at Bull Run. The Union soldiers seized the farm and ran off the Piper’s employee, James Mitchell. Mr. Mitchell was told by the Union’s soldiers that if he returned to the farm, they will shoot him. James’ younger brother, William died in 1864. James and William’s wife, Sarah, put in a claim to the Federal government after the Civil War for the destruction of their property by Union’s soldiers. They estimated their losses to be $1,306.80. The government only reimbursed the Pipers $183.00. In spite of James’ losses, he swore in front of a government representative that he was faithful to the Union. Through court cases, southern claims records, censuses, freedmen bureau records, vital statistic records, freedmen registrations, and newspaper articles, I have been able to examine the losses and the accomplishments of the Piper family. James E. Piper (Ramsay) was married to Ann Elizabeth Brown. They had the following children William, Sarah, Anna, and Thomas. William Henry Piper (Ramsay) was married to Sarah. They had the following children James H, Elizabeth, Alice G., George, and Frederick. James E. Piper in 1876 lived at one of his properties at Pitt, corner of Oronoco Street. In 1888, James lived at his property at 427 North Pitt Street. By 1899, James was living at another one of his properties at 423 North Pitt Street. James owned more than three properties prior to 1900. During James’ lifetime, he witnessed three relatives buried at the Freedmen Cemetery. The relatives were Abraham Lincoln Piper, James Piper, and William Piper. Also James was part of the Trustees of the African American schools prior and after the Civil War. He was an active Republican and he represented District 2 in Alexandria. He served as a juror in the in the late 1860s and in the 1870s. James also experienced other losses. By 1880, his wife Ann had died. Prior to 1876, his sister-in-law, Sarah also died. In 1880, William’s children and their spouses, George N. Piper, Sarah E Piper Fletcher (Carter), and Alice Piper Landreth (William) sued James for their father’s estate. James was not located on the 1900 census, and it is assumed that he might have died between 1883 and 1900. James and his brother, William should have many descendants. Both of them had children and other Piper relatives that once lived in Alexandria. William’s daughter, Elizabeth married Carter Fletcher on May 1, 1879 at Alfred Street Baptist Church. The famous Reverend Samuel W. Madden officiated their wedding. After their marriage, they migrated to Baltimore, Maryland in the 6th Precinct. They lived on Robert Street. Carter and Elizabeth on 1900 census had four children, Harry, Chester, Alice, and Sarah. James and his brother, William had experienced financial independence before the Civil War, but lost their farm and brickyard business during the Civil War. His brother died without having the chance to regain any of his property back. On the other hand, James witnessed the emancipation of all African Americans even though he lost his financial independence. By the time the Civil War ended, James was 45 years old. And by the time he settled his claim with the government in 1880, he was 60 years old. The lifestyle and financial freedom he once had was never going to be regained. At his age, he could not regain what he once had. This entry was posted in Black People of Alexandria and tagged Alexandria West End, Blenker's Brigade, Civil War, Edward Daingerfield, James E Piper, Ramsay. Bookmark the permalink. First, let me commend you on your fine work and the amount of effort you have put into it. James E. Piper, aka Ramsay, died on December 17, 1898 in Washington, D.C. while visiting his daughter, Ann Cornelia Piper Gray. (District of Columbia Deaths, 1874-1959, database located at Familysearch.org; the Washington Times, December 19, 1898, page 2). His funeral took place at Robert’s Chapel in Alexandria on December 20th. (The Washington Times, December 21, 1898, page 2). 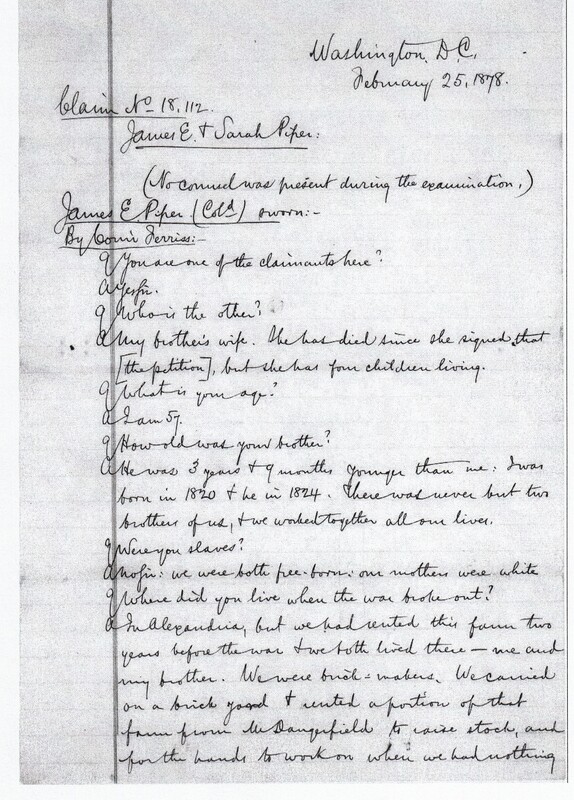 If you send me your email address, I will impart more information about the interesting life of James Edwin Piper and his connection to a civil rights heroine of the 1860’s who was a native of Alexandria.